Author: Lillian Mihayo Mongella. Series edited by: Tanzanian-German Centre for Eastern African Legal Studies. 22 pp. Roman, 229 pp. The monograph, which was developed from the author’s PhD thesis, examines the internal armed conflicts in East African countries und offers a detailed study on the Rwandan genocide. It deals with the situation and the process of the so-called victimization and investigates the right that allows or ought to allow victims to receive compensation for the injuries suffered as a result of these conflicts. Payments of compensation are hard to achieve though, especially in internal armed conflicts. This is due to two facts: On the one hand due to the lack of financial means, particularly in developing countries such as Rwanda, on the other hand due to the challenges of getting the responsible parties to meet their obligations in paying compensations. Often the perpetrators are not able to do so because in many instances civilians who do not have the financial means to pay compensations take part in the atrocious acts. In such situations, the government must fill in and bear the responsibility which is only possible with the help of the international community. Compensation can only be achieved if political steps are taken to implement the appropriate legal measures. Most post-conflict states, however, lack the legal base to support victims in claiming compensation. 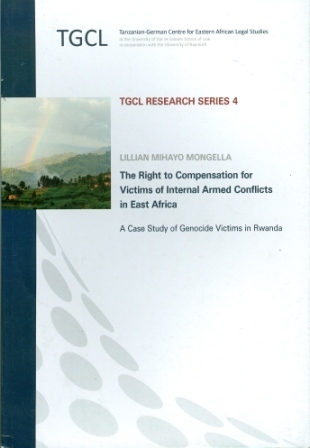 The legal situation in Rwanda in particular is shown in a separate chapter. In her summary, Mongella recommends among other things the enactment of new laws and improvement of existing ones at international, national and regional levels to enable victims obtain justice through compensation.